Arenal Volcano is an unavoidable presence while traveling within this part of the country. Arenal's perfectly symmetrical shape makes it a sightseer's dream, while its abundance of outdoor activities makes it an easy place to check things off your "must-do in Costa Rica" list. Costa Rica is one of the world's most family-friendly destinations. From surfing lessons at Costa Ricas famed beaches to hiking the Arenal Volcano, our Costa Rica Family Adventure will leave your family with lasting memories of family time well-spent. Whether its the thrill of crossing suspended bridges, horseback riding, ziplining through the jungle canopy, learning to surf or floating down the Corobici River, theres something for every member of the family included in our Costa Rica Family Adventure tour. This is your chance to sample all Costa Rica has to offer the active traveler from an ala carte menu of exciting options! Chose from float rafting, mountain biking, waterfall repelling, horseback riding and ziplining through the canopy. There are also kayaking opportunities, hikes and an ATV Safari. Whatever your active spirit craves, you'll find a way to nourish it on our Costa Rica Multi-sport vacation! Our Wonderful Highlights of Costa Rica tour offers a chance to sample landscape of the country's celebrated national parks. In Tortuguero National Park, where the endangered green turtle nest, you'll visit Tortuguero Village, overnight in an eco-lodge and get a close look at jungle vegetation and wildlife during a guided boat tour. At Arenal National Park there are hot springs, an night at a spa/hotel and plenty of activities including rafting, either float or white water. At Manuel Antonio National Park you'll enjoy a guided tour of the park including the white sand beaches and the rain forest where you might see such wildlife as sloths, monkeys, iguanas, and a multitude of insects and birds. 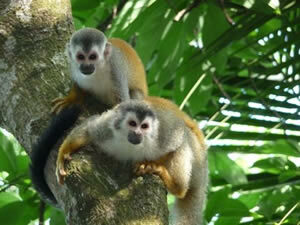 This tour is a great introduction to natural Costa Rica.